Description The tiny creatures from future are trapped in present by evil moss the jelly king. Help the future buddies to return home by helping them to reach the time machine. You can connect the Future Buddy to the holders by clicking on both Buddy and Holder. 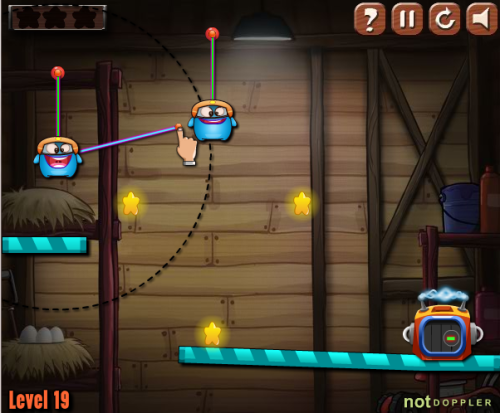 You can cut the rope by dragging the hold down mouse over the rope and release it. This game contains 3 worlds. Total 60 levels. Each world contains 20 levels. To unlock this world you need to collect 48 stars out of 60 from "The Farm House". To unlock this world you need to collect 54 stars out of 60 from "The Tree House".